Garuda Indonesia Airlines will operate large-bodied aircraft serving international flights at Domine Eduard Osok Airport, Sorong City, West Papua, in March 2018. General Manager of Garuda Indonesia Surya Kencana in Sorong, on Tuesday (11/10/2017), said that it has been in operation serving national and international flights from Bangdara Domine Eduard Osok Sorong City. "However, the flight at Sorong Airport still uses medium-bodied aircraft, and planned large-bodied aircraft to operate next year," he said. He said this year's program for Sorong City was a Travel Fair which has been taking place from September 29 to October 1, 2017. Travel Fair program, according to him, offers flight tickets from Domine Eduard Osok Airport to all regions in Indonesia and abroad at a cheaper price to reach the community. He said, the first Travel Fair in Sorong City that offered promo tickets 25 percent of flights from the city of Sorong to all regions in Indonesia and abroad. Sorong Mayor, Lamber Jitmau, separately gives appreciation to Garuda Indonesia programs in Sorong City, especially business programs that provide convenience for the community. He said Air Batik airlines, Sriwijaya Air, and Lion Air had flown big boeing aircraft in Sorong City to improve services for the community. 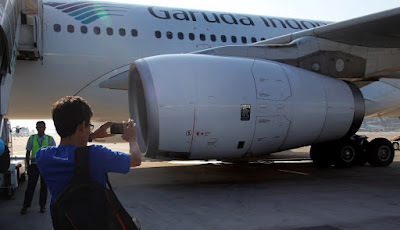 Lambert hopes Garuda Indonesia can compete with other airlines by flying large boing aircraft at Sorong Airport.